In considering ways of theoretically framing my practice I find myself repeatedly reaching for the words of Roland Barthes. In recognising this action it has become necessary to investigate the punctum moments I have experienced in reading his texts and to analyse their importance. 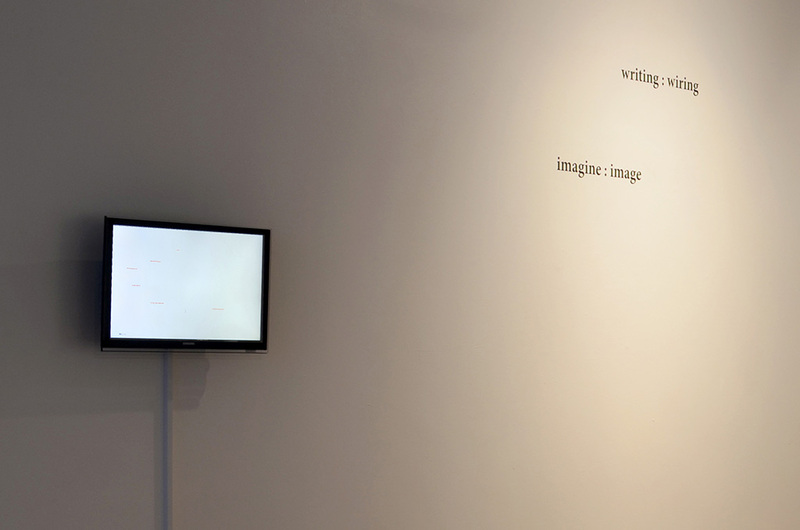 The two works shown in the Testing, Testing exhibition use practice as a way of thinking through some of Barthes’ ideas about reading, writing, and thinking. In making these works I have endeavoured to have a dialogue with Barthes, through his writing, in order to advance my own thinking via practice. This dialogue begins with the process of annotating his texts and thinking about the ways in which his words specifically connect to my practice. Re-reading allows for making notes in a variety of ways: in an academic manner, making conn-ections to other theorists, and exploring the aims of my research. The notes also include free association; allowing my mind to follow a less specific path making connections which may only reveal their relevance at a later date, as well as forming ideas which directly feed the making process. The next stage of the dialogue is to make an artwork as a way of physically thinking through Barthes, in this manner his ideas become embedded in the work. While writing on a computer, my mind frequently moves faster than my fingers (or is it the other way around?). The result is that words get typed with either their letters in the wrong order or an adjacent key is pressed. Either way, the auto-correct function in my word processing software takes over at that point, regularly obliterating my original intention. This sleight of hand happens at such speed that it is often only noticed later, at which point it can be problematic to remember the original word and I am left searching for a credible meaning in order to re-correct the alteration. This work presents both words — intention and correction, exploring the ‘skid within the codes’. Ubiquitous technological systems frequently offer automatic alternatives in various guises. These generalised auto-thinking suggestions can easily become adopted as though they were the original objective. Intention meets correction. In this way the machine looks for an outcome that makes the most sense as the human operative is sidelined — as an impatient parent who snatches the pen from the hand of a child to correct their repeated mistakes. For the purpose of the Testing, Testing exhibition this concept was materialised as several pairs of words, intention and correction symmetrically spaced either side of a colon. The gaps either side of the colon are significant and correlate with a term used by Deleuze: ‘vacuoles of non-communication’.2 Though they contain no visible language they are not empty, and possess a potential energy. They are the spaces inhabited by the other, the unwritten, the unheard, or as yet the unspoken. In considering the scale and font of the text in the space I began to look at the white walls of the gallery as an equivalent of the page surface. Derrida’s assertion that everything in the world is a text and can be read in that manner re-emerged, pushing me to consider the function of the text in the territory between the other artists’ work and loading a further layer of significance to these spaces between the text and around the works. Expanses that are waiting to be read, but yet to be categorised. At the time of writing there are discussions around the possibility of utilising the work in the publication as a connective and dialogic device. Materiality is a substantial method of my practice and the idea of writing as an intransitive verb struck me while reading this Barthes text. Intransitive verbs do not allow for an object as opposed to transitive verbs which are applied to an object, for example: I want to write, as opposed to I want to write a book. This has led to thinking about what it might mean to write without producing an object. The act of making has led me to consider the change in state between wanting-to-write and actually writing. I want to explore the period of time that exists between the fantasy of writing, which Barthes writes about, and the reality of writing and whether that transitional state can be expanded. This provisional state feels generative as it retains its potentiality, everything is yet to be fixed, anything remains possible. In constructing this work I have of course failed. An object has inevitably been produced, but one that never fully reveals itself. Here the meaning continues to be denied even after the process of typing is activated. The content is omitted from the digital page and as Craig Dworkin writes ‘omissions within a system permit other elements to appear more clearly’.4 When faced with the seemingly blank digital screen other details rise to the surface. The pulsing cursor is demanding, even as the writing movement seems to hesitate, the blinking continues pushing for further action with no sympathy for uncertainty. The word counter steadily keeps score though nothing ever materialises to correspond with its tally. The red underscoring of unreadable mistakes scar the white surface, while the autocorrect function flickers varied suggestions for the words it algorithmically is able to read as errors, while the writing process continues below the visible surface. 2 Gilles Deleuze, ‘Postscript on the Societies of Control’, October, vol. 59, no. 3, (1992). 4 Craig Dworkin, No Medium (Cambridge, MA: MIT Press, 2013), p. 9. Rachel Smith is an artist, educator, and researcher based in Sheffield. Her doctoral research Drawing out Language: Disrupting Narrative Sense through Conceptual Writing explores the processes of sense-making in relation to language, through the materialisation of less visible actions associated with reading, writing, listening, and thinking. 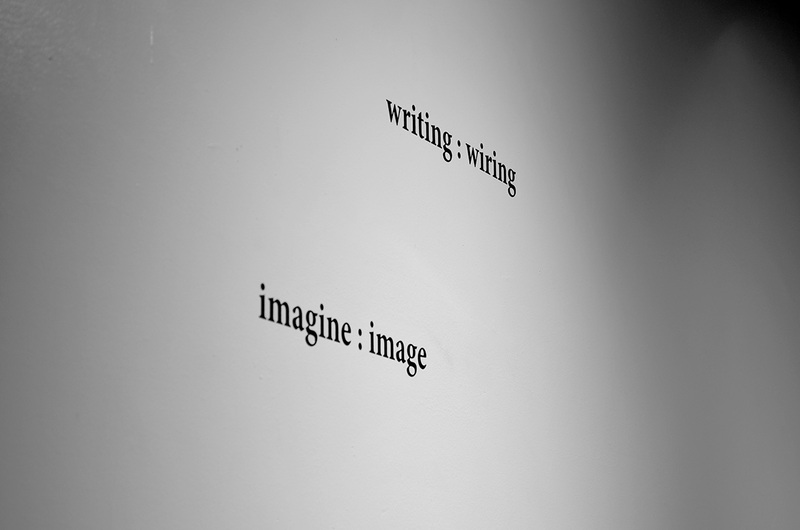 Her work explores the territory between art, conceptual writing, and art writing. Drawing, photography, and writing are all used to interrogate the fragmentary experience of communication. Rachel completed her Masters degree at Sheffield Hallam in 2013, and she has exhibited widely in the UK, including at the Bury Text Festival and the Leeds College of Art Library Intervention Project. Her work Reading Words was part of the AMBruno artist-book project Words, which can be found in the British Library, The Poetry Library and Tate Collection.